The Books for Walls Project: Save Troy Library Tuesday: Tell Two Friends! 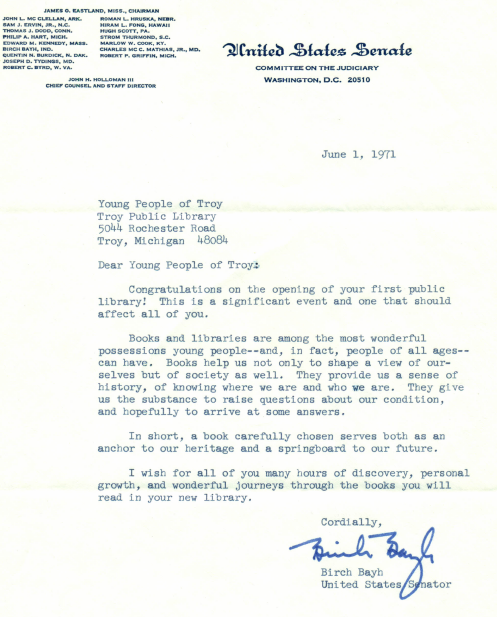 Save Troy Library Tuesday: Tell Two Friends! Every Tuesday for the next several weeks we are going to focus on helping save Troy Public Library. 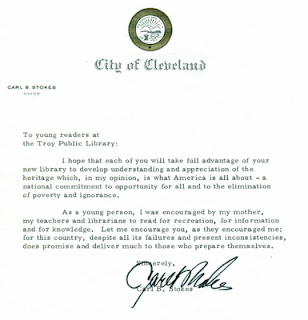 With so many threatened libraries, why did we choose to focus on TPL? Simple: after our visit last month we realized how important every library is and The Sisters really like TPL in particular. We committed to spend time researching and interviewing and working to help Get Out the Vote for TPL on August 2, 2011. 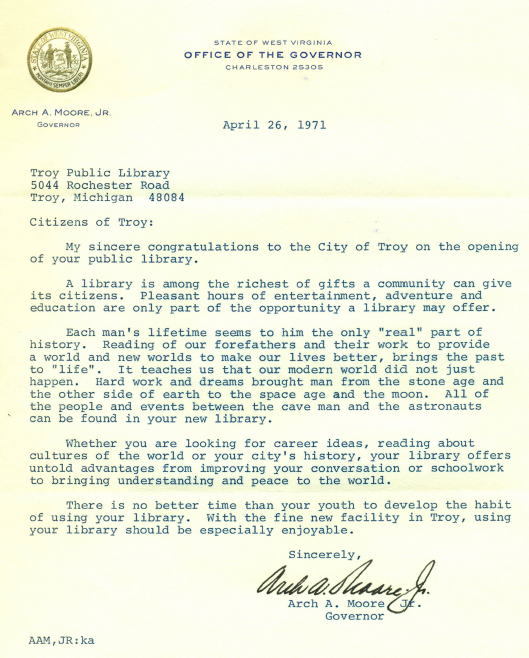 In addition to updates, each week we will share some of the Letters to the Children of Troy* highlighting amazing quotes from amazing public figures back in 1971 --the letters speak clearly to the citizens of today: "save this wonderful library"! Even if you don't live in Troy you can help: just tell two friends, just two, tell them to tell their friends to pass this message to the people of Troy "VOTE YES August 2nd and Save Troy Public Library!" We showed The Sisters the old Faberge Shampoo commercial and explained how word of mouth can spread a message like wild fire --we cannot promise "super fresh smelling hair" but we can promise that it feels really good to help a library. So tell two friends! For residents of Troy: What will the Library Millage Cost? click the link and find out. Who is Arch A. Moore, Jr? 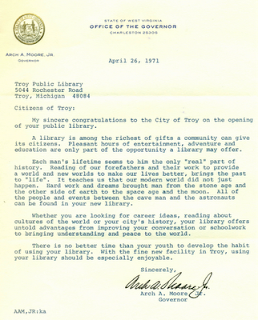 My sincere congratulations to the City of Troy on the opening of your public library. A library is among the richest of gifts a community can give its citizens. Pleasant hours of entertainment, adventure and education are only part of the opportunity a library may offer. Each man's lifetime seems to him the only "real" part of history. Reading of our forefathers and their work to provide a world and new worlds to make our lives better, brings the past to "life". It teaches us that our modern world did not just happen. Hard work and dreams brought man from the stone age and the other side of the earth to the space age and the moon. All of the people and events between the cave man and the astronauts and can be found in your new libarry. Whether you are looking for career ideas, reading about cultures of the world or your city's history, your library offers untold advantages from improving your conversatons or schoolwork to bringing understanding and peace to the world. There is no better time than your youth to develop the habit of using your library. With the fine new facility in Troy, using your library should be especially enjoyable. Congratulations on the opening of your first public librrary! This is a significant event and one that should affect all of you. Books and libraries are among the most wonderful possessions young people--and, in fact, people of all ages-- can have. Books help us not only shape a view of ourselves but of society as well. They provide us a sense of history, of knowing where we are and who we are. They give us the substance to raise questions about our condition, and hopefully to arrve at some answers. In short, a book carefully chosen serves both as an anchor to our heritage and a springboard to our future. I wish for all of you many hours of discovery, personal growth, and wonderful journeys through the books you will read in your new library. I am most pleased to contribute my thoughts on your new library, and pleased to convey my congratulations on providing this new facility. To the young people of your community, I would like to urge an active and constant use of the library. As I reflect back on my youth, I remember many, many pleasant hours in the library and with the books selected. This love of books and libraries has continued with me throughout my life and continues to grow. 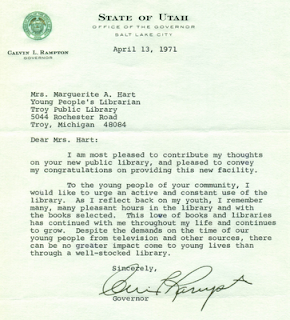 Despite the demands on the time of our young people from television and other sources, there can be no greater impact come to young lives than through a well-stocked library. 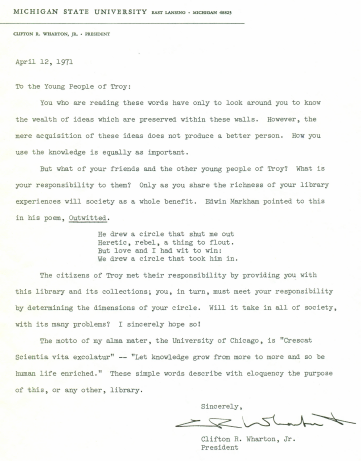 I hope that each of you will take full advantage of your new library to develop understanding and appreciation of the heritage which, in my opinion, is what America is all about - a national commitment to opportunity for all and to the elimination of poverty and ignorance. 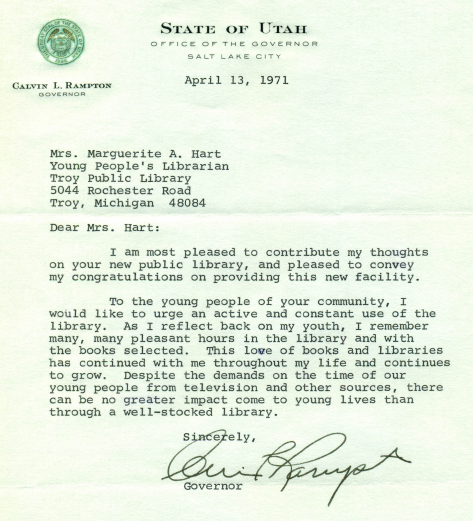 As a young person, I was encouraged by my mother, my teachers and librarians to read for recreation, for information and for knowledge. Let me encourage you, as they encouraged me; for this country, despite all its failures and present inconstancies does promise and deliver much to those who prepare themselves. It is a real pleasure for me to write to the children of Troy, through your office and to point out to them the wonderful world that can develop for them through the library. The Library can be the gateway to a marvelous experience in travel, history and literature. Through the library we can talk to Abraham Lincoln, ride elephants with hannibal and paint fences with Tom Sawyer. And all without leaving our chair! 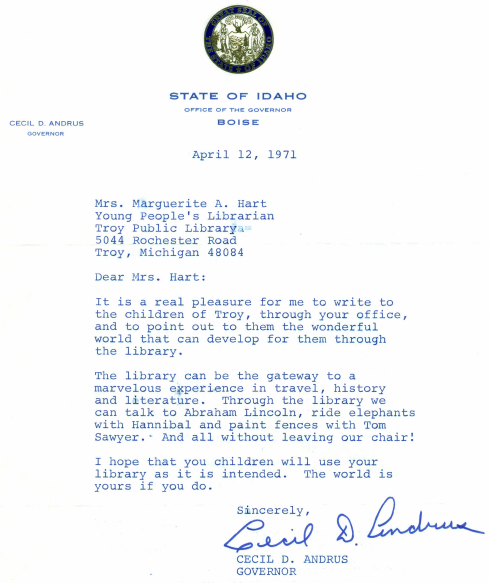 I hope that you children will use your library as it is intended. The world is yours if you do. 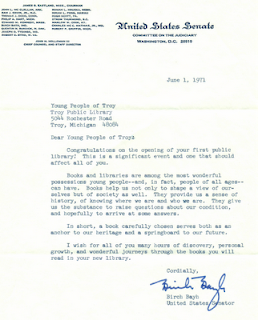 Please extend our sincerest congratulations to the young people of Troy on their new library facility. Libraries play an important role in our lives by providing opportunities for continuing education, as well as recreation and enjoyment. The educational role of libraries becomes increasingly important as citizens are faced with a complex array of issues involving the well being of the community and the Nation. By providing materials for the study of current topics, libraries contribute substantially in the creation of an informed citizenry. The U.S. Department of Agricultures's support of libraries is illustrated in the construction of the new National Agricultural Library Building in Beltsville, Maryland. This new facility houses one of the world's largeast specialized collecions on agriculture sciences, second only to the Library of Congress. The National Agricultural Library services the needs of science researchers on a national and world-wide basis. 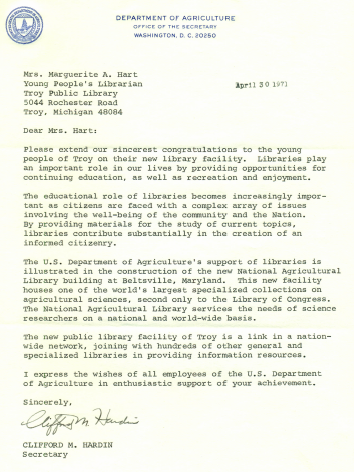 The new public facility of Troy is a link in a nation-wide network, joining with hundreds of other general and specialized libraries in providing information resources. I express the wishes of all employees of the U.S. Department of Agriculture in enthusiastic support of your achievement. You who are reading these words have only to look around you to know the wealth of ideas which are preserved within these walls. However, the mere acquisition of these ideas does not better a person. How you use the knowledge is equally important. But what of your friends and the other young people of Troy? What is your responsibility to them? Only as you share the richness of your library experiences will society as a whole benefit. Edwin Markham pointed to this in his poem Outwitted. The citizens of Troy met their responsibility by providing you with this library and its collections; you, in turn, must meet your responsibility by determining the dimensions of your circle. Will it take in all of society with its many problems? I certainly hope so! The motto of my alma mater, the University of Chicago, is "Crescat Scientia vita excolatur" -- "Let knowledge grow from more to more and so be human life enriched." These simple words describe with eloquency the purpose of this, or any other, library.